With a wealth of HGTV shows such as “Fixer Upper” and “Flip Or Flop,” many Americans are looking into the logistics of buying a fixer upper, a term for a old or run-down home that needs a lot of work for it to be livable. While it is important to remember that the people on HGTV are professionals, they certainly make it look easy. 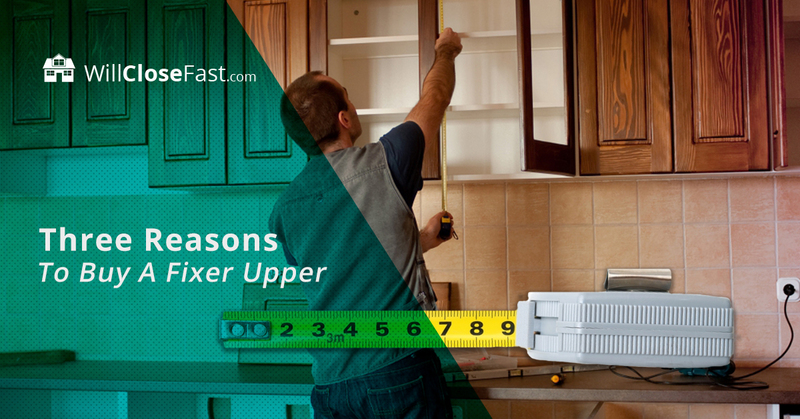 There are a lot of good reasons to buy a fixer upper, and a few not-so-good reasons. Today, we want to talk about a handful of reasons that people invest their money into fixer uppers. Will Close Fast is one of the leading realtor investors in Missouri. While we specialize in buying houses for cash, we also sell the properties we buy. Some of these we fix up to make look brand new, and others we simply hold onto until another investor wants to purchase it as a fixer upper. If you are interested in buying a fixer upper, drop us a line today and we’ll help you find what you are looking for. Want To Buy A Fixer Upper? We Can Help! “Flipping” a house refers to buying an old home, fixing it up, and selling it as quickly as possible to make money. If you have money to invest, have time on your hands, and can do a variety of home projects yourself, this could be a good option for you. The key here is to sell fast because you don’t actually live in the home you are flipping. The longer it takes to sell, the longer you have to pay taxes and mortgage payments. Another reason to buy a fixer upper is so you have a blank canvas to turn in to your dream home. While some people will do this by building a home from the ground up, this route is often more expensive and requires you to have a place to live while your home is being built. Buying a fixer upper at a low cost ensures the bones of your home are already standing. While it may not be perfect at first, you can make upgrades at your own pace until the home looks exactly how you envisioned it. This is the oldest real estate advice around. When it comes to real estate, location is everything. You can fix your own house, but you can’t fix the whole neighborhood. For this reason, buying a fixer upper in a good neighborhood means you can fix it up and exponentially increase the value of the home. A fixed-up home in a good neighborhood will always sell for more than an identical home in a run-down neighborhood. While buying a new home in your favorite location would be ideal, it’s not financially feasible for every person. This allows you to get into the location you want to be in and fix up your home over time – possibly even selling it and making a profit years later. Want To Purchase A Fixer Upper? We Can Help! Will Close Fast has fixer uppers for sale throughout Missouri. If you are interested, give us a call or send us an email. If you are looking to sell your house for cash, we can help with that too. You no longer need to search the internet for, “How to sell my house?” Missouri residents can rest assured knowing that we buy houses in St. Charles, St. Louis, and the surrounding areas for cash. We specialize in closing fast and quick turnarounds to fit your needs. Contact us today!